If this is your first visit to akhilendra.com then you might not be aware but if you have visited our site in the past, you might have noticed change in its design. I have upgraded to Genesis 2.0 and elevan40 pro theme. I have been using eleven40 theme from studiopress based on genesis framework for a while now and I must say it’s been a joyride. Before using Elevan40 theme, I was using thesis theme. I must say you will see a real difference the moment you switch to studiopress theme. Genesis is way better as framework and with Genesis 2.0, it has gone to completely new level. Genesis 2.0 comes with a improved theme for default genesis theme. This theme itself is awesome to be used for any kind of blog. So if you have been thinking of switching to Genesis but couldn’t because genesis theme without studiopress theme was not looking very attractive, now you don’t have to bother about that. Genesis 2.0 comes loaded with a awesome theme. Genesis 2.0 is html5 ready. If you need to learn about advantages of html5, click here. Html 5 add huge boost to your site, it is the future. Therefore you are using Genesis 2.0, then your site is future ready.Genesis 2.0 also improves cross browser compatibility. Genesis themes are mobile response and with Genesis 2.0 further improves upon it. So your visitors can comfortably browse your site on any device like laptop, ipad or iphone. No other theme can support audio and video like Genesis 2.0, thanks to html5 in Genesis 2.0. Genesis 2.0 themes have got built-in schema.org microdata which improves your SEO ranking in modern world of search engines which focus on better presentation of content. Along with Genesis 2.0, studiopress themes have also released elevan40 pro theme and sixty nine theme. Currently my site is using elevan40 pro theme. If you want to read detailed studiopress theme review, click here. This theme is simply awesome and best for all kind of blogs. If you need to learn more about Genesis 2.0, click here. If you are a existing customer of studiopress themes, then you can upgrade to genesis 2.0 and elevan40 pro themes for free. You can login to your account and download them for free. 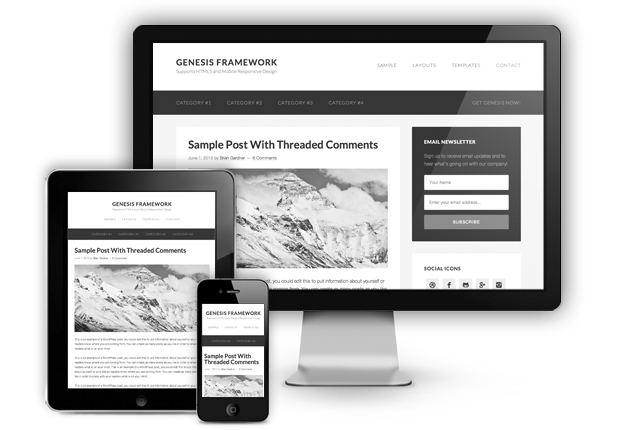 Genesis 2.0 and studiopress themes are the best wordpress themes. Please share your feedback about the new looks of my blog and about Genesis 2.0. It seems to be a great alternative, design looks nice. I was looking for changing the theme for my blog as I am using same theme since last 6 months. I could not find some any alternative so remain with the same. Now I guess I found the one I was looking for future prospective. Thank you akhilendra for introducing us with Genesis 2.0 & Elevan40 Pro Themes.